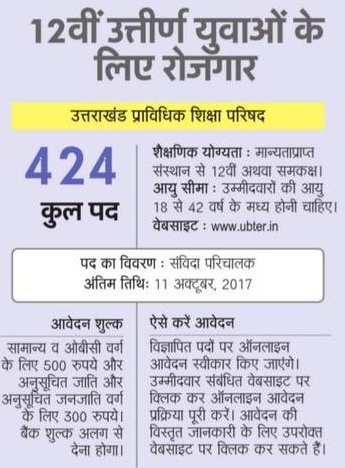 UBTER Samvida Parichalak Bharti started to apply online for 424 Bus Conductor Recruitment in Uttarakhand Board of Technical Education. On 9.09.2017 Advertisement issued to fill 124 Bus in Dehradoon Dipo where it will run, so 124 Bus needs 424 Bus Conductor (Samvida Parichalak). All u need to know that is this is 12th pass and candidates who are 18th age limit can also apply. Educational Qualification : Should have Passed Intermediate ( 12th) or Graduate, Master from a recognized Board/ Institute or its equivalent. Age Limit As on 01.07.2017: - 18 to 42 Years. Age relaxation is as per UK Govt. norms. Application Fee : For General/ OBC Candidates : Rs. 500/- and For SC/ ST Candidates : Rs.300/- through Online Mode i.e. Net Banking/Debit Card/Credit Card. How To Apply : Interested and Eligible applicant must fill form on http://www.ubterec.in/ to Apply Online. Last Date to fill Online Form: 11th October, 2017.